AIM: To investigate the anti-proliferative and apoptotic effects of Chaga mushroom (Inonotus obliquus) water extract on human hepatoma cell lines, HepG2 and Hep3B cells. METHODS: The cytotoxicity of Chaga extract was screened by 3-[4,5-dimethylthiazol-2-yl]-2, 5-diphenyltetrazolium bromide (MTT) assay. Morphological observation, flow cytometry analysis, Western blot were employed to elucidate the cytotoxic mechanism of Chaga extract. RESULTS: HepG2 cells were more sensitive to Chaga extract than Hep3B cells, as demonstrated by markedly reduced cell viability. Chaga extract inhibited the cell growth in a dose-dependent manner, which was accompanied with G0/G1-phase arrest and apoptotic cell death. In addition, G0/G1 arrest in the cell cycle was closely associated with down-regulation of p53, pRb, p27, cyclins D1, D2, E, cyclin-dependent kinase (Cdk) 2, Cdk4, and Cdk6 expression. CONCLUSION: Chaga mushroom may provide a new therapeutic option, as a potential anticancer agent, in the treatment of hepatoma. Chaga mushroom (Inonotus obliquus), a white rot fungus, belongs to the hymenochaetaceae family of Basidomycetes. Chaga mushroom grows on birch trees in colder northern climates. Since the sixteenth century, Chaga has been used as a folk medicine in Russia and western Siberia. Recently, many polyphenolic compounds including triterpenoids, steroids, and ergosterol peroxides from Inonotus sclerotia have shown various biological activities, including anti-bacterial, hepato-protective, and anti-tumor[5–7] effects. However, its molecular mechanisms to the anti-tumor effects have not been well documented, in spite of its increasing usage. Natural products including thousands of compounds that exist in fruits, vegetables, mushrooms and medical plants have been used as a source of therapeutic agents for several types of cancer or health food supplements in humans. Especially, medicinal mushrooms, including genera Auricularia, Flammulina, Pleurotus, and Trametes, have been proven to express promising anti-tumor, immune modulating, antiviral, and antiparasitic effects. It has been reported that medicinal mushrooms showed the cytotoxic effects in cancer cells by induction of apoptosis accompanying modulated cell cycle progression. Cell proliferation and death are involved in the maintenance of homeostasis in normal cells; however, homeostasis is often disrupted in tumor cells with uncontrolled proliferation. Anti-tumor effects could be attributed to altered biochemical mechanisms, including inhibitions of proliferation, induction of cell cycle arrest at various cell cycle checkpoints, enhanced apoptosis, and regulation of signal transduction pathways, which are related to altered expressions of key enzymes. Cyclin-dependent kinases (Cdks), CDK inhibitors (CDKIs), and cyclins are important regulators of cell cycle progression. Also, each phase of the cell cycle is governed by different Cdks associated with their individual regulatory subunits, cyclins. The G0/G1 phases of the cell cycle were controlled by Cdk4/Cdk6 associated with cyclin D, late G1 into early S phase by Cdk2 with cyclin E, S phase by Cdk2 with cyclin A, and G2/M phase by Cdc2 kinase (CDK1) with cyclin A/cyclin B. An increased expression of Cdks and cyclins accompanied by an enhanced CDK activity have been observed in most cancer cells, which could be involved in uncontrolled and unchecked cell proliferation. Recently, many studies have shown that the inhibition of CDK activity, which led to cell cycle arrest, has turned out to be the most promising strategy for the discovery and design of novel anticancer agents. Therefore, cell cycle arrest and the induction of apoptosis in cancer cells become the major indicators of anti-cancer effects. In this study, we investigated the anti-tumor effects of Chaga extract and the molecular mechanisms by which Chaga extract exerts inhibitive effects on liver cancer cells, HepG2 cells. The water extract of Chaga mushroom was prepared as follows. The Chaga mushroom, Inonotus obliquus, collected in Russia was used in this study. Chaga mushroom was extracted under optimal water extraction condition. The crushed dry mushroom (1.00 kg) was boiled for 4 h at 100°C, cooled to room temperature, and then filtered. The extract was evaporated to dryness with a rotary vacuum evaporator and freeze-dried to give a powder (250 g). The stock solution of Chaga extract was prepared by dissolving Chaga powder in distilled water (50 mg/mL) and the experimental concentrations were diluted in the basal medium. Human hepatoma cell lines, HepG2 and Hep3B, and the Chang normal liver cell line were obtained from American Type Culture Collection (Rockville, MD) and maintained in MEM (Gibco, Grand Island, NY) supplemented with heat-inactivated fetal bovine serum (FBS, Gibco), penicillin (100 U/mL) and streptomycin (100 &mgr;g/mL) under 5% CO2 in a humidified incubator at 37°C. Propidium iodide (PI), Triton X-100, and ribonuclease-A were purchased from Sigma (St. Louis, MO, USA). Antibodies were purchased from Santa Cruz Biotechnology (Santa Cruz, CA). Cell viability was quantified using 3-(4,5-dimethylthiazol-2-yl)-2, 5-diphenyltetrazolium bromide (MTT). Briefly, the cells were plated in 48-well culture plates at a density of 5 × 104 cells/well and allowed to adhere at 37°C for 12 h. The following day, various doses of Chaga extract were added to the cells and further incubated for 48 h. Then, MTT (0.5 mg) was added to 1 mL of cell suspension for 4 h. The ability of cells to form formazan crystals by active mitochondrial respiration was determined by using a Microplate reader (Titertek Multiskan, Flow Laboratories, North Ryde, Austria) after dissolving the crystals in DMSO. An empty well was used as a blank. Cytotoxicity was expressed as a relative percentage of the absorbencies measured in the control and Chaga-treated cells. Morphological changes after exposure to Chaga extract were observed by a phase-contrast inverse microscope (Olympus, Japan). For the measurement of cellular DNA content, flow cytometric analysis was used. Briefly, 5 × 105 cells were seeded in six-well plates, and allowed to attach overnight. Cells were treated with different concentrations of Chaga extract (250, 500, 750, 1000 &mgr;g/mL) for 48 h. The cells were then harvested by trypsin treatment, washed with cold PBS, and then stained with propidium iodide (PI) solution (50 &mgr;g/mL of PI, 100 &mgr;g/mL RNase, and 0.1% Triton X-100 in PBS). The stained cells were analyzed for DNA histograms and cell cycle phase distribution by flow cytometry (FACSCalibur, BD Bioscience). Data from 10 000 cells per sample were collected and analyzed with CellQuestTM software (Becton Dickinson). To determine G1, S, and G2/M-phase cell populations, the settings for 2 mol/L and 4 mol/L DNA content peaks were obtained within each experiment using the G0/G1 arrested cell (2 mol/L) in control as the reference and applied to all samples within a given experiment. Cytosolic protein extracts were prepared as in previously described methods. Briefly, cells were collected by centrifugation at 300 ×g for 5 min at 4°C and washed with cold PBS. The cell pellet was then resuspended in 500 &mgr;L of lysis buffer (20 mmol/L HEPES- KOH, pH 7.5, 250 mmol/L sucrose, 70 mmol/L mannitol, 1.5 mmol/L MgCl2, 10 mmol/L KCl, 10 &mgr;g/mL leupeptin, and 10 &mgr;mol/L digitonin). After 10 min incubation at 25°C, the sample was spun at 14 000 ×g for 15 min, and the supernatant containing cytosolic proteins was stored at -70°C until analyzed by polyacrylamide gel electrophoresis (SDS-PAGE). The protein extract was subjected to standard SDS-PAGE, transferred onto polyvinylidene difluoride membranes (Millipore), and probed with appropriate antibodies as described individually in the figure legends. The bound primary antibody was detected by using appropriate horseradish peroxidase-conjugated secondary antibody, and the reaction band was visualized using an enhanced chemiluminescence detection kit. Western blot analysis was done using primary antibodies against pRb, p53, p27, Cyclin E, D2, D1, Cdk2, 4, 6, pro-caspase 3, and β-actin (Santa Cruz Biotechnology) at optimal dilution. β-actin was used as an internal control to confirm that the amounts of protein load were equal. The data shown are a summary of the results from at least three experiments and are presented as the mean ± SD. Statistical evaluation of the results was performed by one-way ANOVA. The results were considered significant at a value of P < 0.05, P < 0.01. To evaluate the effects of Chaga extract on cell proliferation and morphology of hepatoma cells, we first determined the antiproliferative effects of Chaga extract on human hepatoma cells, HepG2 and Hep3B, as well as immortalized normal liver cells, Chang. The cells were exposed to various doses of Chaga extract for 48 h and cell viability was determined by MTT assay. As shown in Figure 1A, the survival curve showed that Chaga extract had dose-dependent cytotoxic effects on HepG2 and Hep3B cells; however HepG2 cells were more sensitive to Chaga extract than Hep3B cells (Figure 1A). Within 48 h after exposure to 750 &mgr;g/mL of Chaga extract to HepG2, cell viability was reduced by 60% of control (P < 0.01). After treatment with 1000 &mgr;g/mL of Chaga extract for 48 h, cell viabilities of HepG2 and Hep3B were 36% and 67%, respectively. In contrast, Chang normal liver cells were not markedly affected by the treatment with Chaga extract (1000 &mgr;g/mL) for 48 h (Figure 1A). Taken together, these data indicated that Chaga extract significantly exerted apoptotic death in hepatoma cells, such as HepG2 and Hep3B cells. We next examined whether the cytotoxicity of Chaga extract is related to the induction of apoptosis. HepG2 cells were treated with 750 &mgr;g/mL of Chaga extract for 48 h, and morphological change of the cells was assessed using light microscopy. Chaga extract-treated cells (Figure 1B) showed a distinct decreased cell population compared with control cells. Figure 1 Cytotoxic effect of Chaga extract on human hepatoma cells. A: The various cells, HepG2, Hep3B, and Chang normal liver cells, were treated with various doses of Chaga extract for 48 h. Cell viability was measured by MTT assay. Data represented as means ± SD of three independent experiments. aP < 0.05, bP < 0.01, vs control cells; B: The morphological changes of HepG2 cells after exposure to Chaga extract (750 &mgr;g/mL) for 48 h. The photomicrography was taken under a phase contrast microscope (× 200). Since the cell growth and inhibition are both tightly regulated by cell cycle control, next, we investigated the possible inhibitory effect of Chaga extract on cell cycle distribution by flow cytometry analysis. Representative histograms for cell cycle distribution in HepG2 cells following exposure to various concentrations of Chaga extract are shown in Figure 2A. The effects of Chaga extract on HepG2 cell cycle distribution are summarized in Figure 2B. As shown in Figure 2B, treatment of HepG2 cells with 750 &mgr;g/mL of Chaga extract for 48 h resulted in a higher number of cells in the G0/G1 phase (75.3%) compared to media control (62.1%). This increase was coupled with the decreased percentage of cells in S phase. After a 48 h treatment, the percentage of S phase in Chaga extract-treated cells was 2.78%, whereas 9.25% in control cells. In addition, flow cytometry analysis also revealed the effect of Chaga extract on the induction of apoptosis: increase of cell percentage in the sub-G0/G1 phase. As shown in Figure 2C, the percentage of the sub-G0/G1 fraction in Chaga extract-treated cells was increased in a dose-dependent manner, indicative of apoptotic cell death. In a while, caspases are activated during apoptosis by proteolytic processing at specific aspartate cleavage sites. Therefore, we determined whether the induction of apoptosis by Chaga extract resulted in an activation of caspase-3, which is a key caspase activated in apoptotic cell death (Figure 2D). 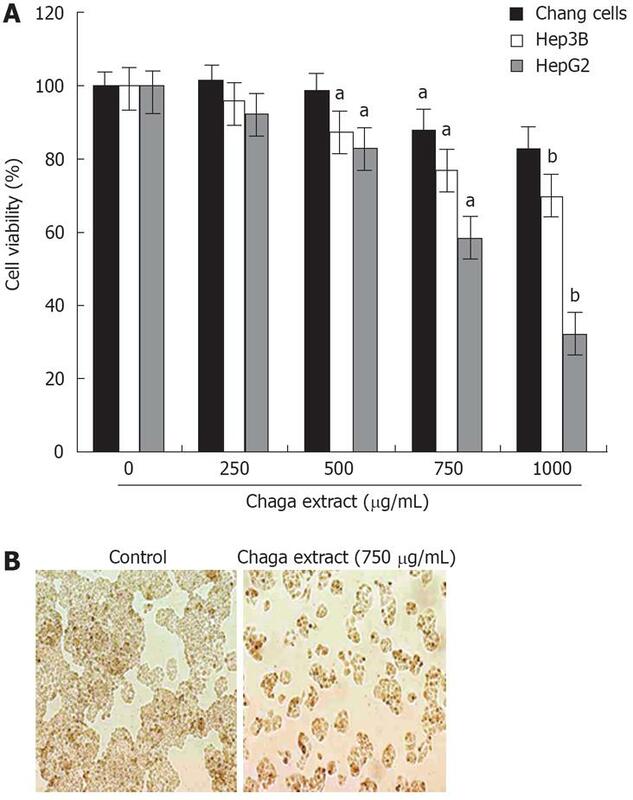 As shown in Figure 3D procaspase-3 was markedly decreased in Chaga extract-treated HepG2 cells. These data suggest that inhibition of cell proliferation or induction of cell death in HepG2 cells by Chaga extract may be exerted by the induction of G0/G1 phase arrest and subsequent apoptotic process accompanying caspase-3 activation. Figure 2 Apoptotic cell death of HepG2 by Chaga extract. The effect of Chaga extract on cell cycle progression of HepG2 cells was determined. HepG2 cells were treated with various doses of Chaga extract for 48 h. Then, cells were harvested and washed with cold PBS. A: Cellular DNA content was stained with PI solution and flow cytometric analysis was performed to analyze the cell cycle distribution. Cell cycle histogram was shown; B: A summary of cell cycle distribution data in histograms. Data represented as means ± SD of three independent experiments. aP < 0.05, vs control cells; C: The percentage of subG0/G1 phase was represented as % of apoptosis. Data represented as means ± SD of three independent experiments. aP < 0.05 vs control cells; D: Caspase-3 activation, which was measured by cleavage of procaspase-3, in Chaga extract-treated HepG2 cells was determined by western blot analysis. Figure 3 Effect of Chaga extract on the modulators of cell cycle such as p53, pRb, and p27. Western blot analysis for p53, pRb and p27 was performed using specific antibodies with β-actin as a loading control. Tumor suppressor gene p53 has been shown to play an important role in the induction of cell cycle arrest and apoptosis. Also, pRB has been known to play a critical role in the G1 to S phase cell cycle transition. Since the inhibitory mechanism of Chaga extract on cell proliferation might be caused by the expression of negative regulators of the cell cycle, we evaluated the protein expression of p53, pRb, and p27. As shown in Figure 4, we found that p53 and pRb protein was obviously decreased by Chaga extract in a dose-dependent manner in HepG2 cells (Figure 3). The p27, a specific inhibitor of CDKs, is mainly involved in G1/S transition of the cell cycle. The p27 was also markedly down-regulated by treatment with Chaga extract in a dose dependent manner (Figure 3). 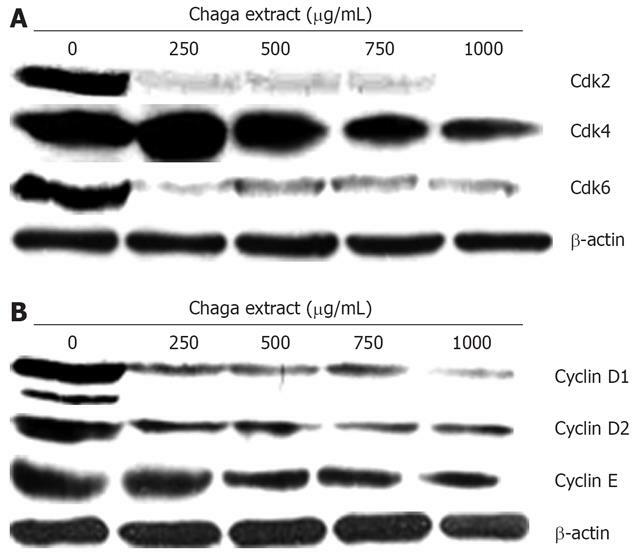 Figure 4 Effect of Chaga extract on the protein levels of G0/G1 regulatory Cdks and cyclin in HepG2 cells. The effect of Chaga extract on the protein levels of G0/G1 regulatory Cdks and cyclin in HepG2 cells was determined by western blot. Western blot analysis for Cdks ( A: Cdk2, Cdk4, and Cdk6) and Cyclins ( B: Cyclin D1, Cyclin D2, and Cyclin E) was performed using specific antibodies with β-actin as a loading control. To analyze the underlying biochemical mechanisms involved in the regulation of the G0/G1 cell cycle arrest, we investigated the effect of Chaga extract on the protein levels of the Cdks and cyclins during G0/G1 cell cycle arrest progression. As shown in Figure 4A, treatment of HepG2 cells for 48 h with Chaga extract resulted in a prominent decrease in the expressions of Cdk2, Cdk4, and Cdk6 in a dose-dependent manner. Of note, a marked reduction in Cdk2 and Cdk6 was observed even at a dose of 250 &mgr;g/mL of Chaga extract. In addition, Chaga extract markedly decreased the expression of Cyclin D1, D2, and E (Figure 4B). These observations suggest that the down-regulation of the levels of cyclin/Cdk proteins in Chaga extract-treated HepG2 cells is closely related to the induction of G0/G1 arrest of cell cycle progression. Several anti-cancer drugs or compounds for cancer treatment have been found in natural products. 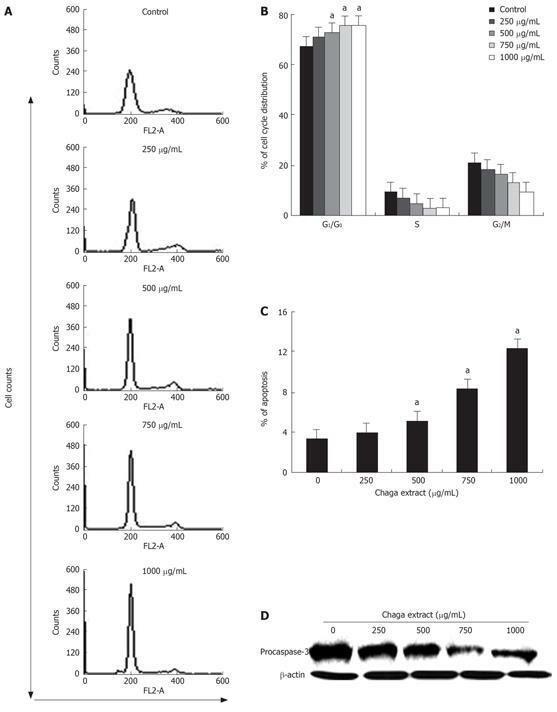 In this study, we found that aqueous extracts of Chaga mushroom (Inonotus obliquus) caused a growth inhibition of human hepatoma HepG2 cells, and this was closely associated with the arrest of the cell cycle in G0/G1 phase and induction of apoptosis. The eukaryotic cell cycle is regulated by signal transduction pathways mediated by a series of cell-cycle regulators. Cyclins are positive regulators of cell cycle progression and function by forming a complex with CDKs. CDK inhibitors are negative regulators of the cell cycle and bind to cyclin-CDK complexes and inhibit the activity of those complexes. Therefore, induction of cell cycle arrest and apoptosis by chemopreventive drugs could be an effective approach to treat uncontrolled cell proliferation and survival in tumor cells. In recent years, mushroom extracts have been found to have anti-inflammatory, anti-tumor properties. Although it has been reported that the Chaga mushroom and other mushrooms have therapeutic effects such as anti-tumor, anti-inflammatory and hepatoprotective effects, the mechanisms of anti-inflammatory and anti-tumor effects of the Chaga mushroom have not been clearly elucidated. In the present investigation, we showed that the water extract of the Chaga mushroom, which has been used in the treatment of cancers and digestive system diseases, significantly inhibited the viability and proliferation, and induced apoptotic cell death in human hepatoma HepG2 cells (Figure 1A), but this effect was not found in Chang cells, the human immortalized non-tumor cell line (Figure 1C). These data indicate that Chaga extract has selective cytotoxic effects on human hepatoma cells. This selectivity may be the great advantage of the Chaga extract for therapeutic or preventative use in cancer treatment. Though there were several reports that many natural products induce cell cycle arrest in various cell cycle phases, this study is the first report that reveals the inhibitory effect of Chaga extract on the cell cycle in cancer cell lines. In this study, flow cytometric analysis clearly revealed that HepG2 cells were dose-dependently arrested by Chaga extract at the G0/G1 phase of the cell cycle (Figure 2A). The blockade of survival pathways or the induction of apoptosis pathways by anti-cancer agents prevents the proliferation of cancer cells, which may be exploited for cancer therapy. p53 is a tumor suppressor gene encoding a transcription factor. Its tumor-suppressive activity involves inhibition of cell proliferation through cell cycle arrest and/or apoptosis. Mutation in p53 occurs in more than half of human cancers[24–26]. Therefore, the activation of p53 by anticancer agents may induce the cell cycle arrest and apoptosis in cancer cells leading to the inhibition of tumor progression. HepG2 has a functional p53 (wt p53), however Hep3B does not have a functional p53 (delete p53). In our study, HepG2 cells were more sensitively damaged by Chaga extract than Hep3B cells (Figure 1). Therefore, we speculated that wt p53 plays an important role on the apoptosis-inducing effect of Chaga extract in HelpG2 cells. However, our data did not show whether the activation of p53 may mediate the cytotoxicity and cell cycle arrest in Chaga extract-treated HepG2 cells, because wt p53 was down-regulated by Chaga extract (Figure 4). Interestingly, Park et al (2006) showed that 6-gingerol, a major phenolic component in ginger, induced G0/G1 arrest with up-regulation of p21WAF1 expression and down-regulation of p53/pRb expression in pancreatic cancer cells. In the present study, the down-regulation of pRb and p27 protein expression as well as p53 was detected in the Chaga extract-treated HepG2 cells. Our major question remaining to be addressed is that the down-regulation of p53, pRB, and p27 protein, are closely associated with the terminal differentiation or the other signaling pathways levels. However, unfortunately, this question cannot be addressed at the present time. Eukaryotic cell cycle progression involves sequential activation of Cdks, whose activation is dependent upon their association with cyclins. G1-phase arrest of cell cycle progression provides an opportunity for cells to either undergo repair mechanisms or proceed by the apoptotic pathway. It has been suggested that Cdk activities control G1/S transition in mammalian cells. Both D- and E-type cyclins are known to be important regulators in G1/S control, even though some reports raised the possibility that they have other distinct roles. In our results, we found that treatment with Chaga extract causes a significant decrease in the expression of cyclin D1, D2 and E and Cdk 2, Cdk4, Cdk6 in HepG2 cells. Thus, we speculated that the reduction of cyclin or Cdk expression resulted in the blocking of cyclin/Cdk complex formation and that lowered the levels of pRb (Figure 3). When Rb proteins remain in an unphosphorylated form, E2F cannot be activated and the cells fail to enter the S phase. Based on the data (Figure 4), it seems that cyclin D1 and Cdk2, and Cdk6 are responsible for most of the cell cycle arrest observed in response to Chaga extract because these regulators are effectively deceased at the lowest dose of Chaga extract (250 &mgr;g/mL). Taken together, we concluded that Chaga extract induced the growth inhibition, G0/G1-phase arrest, and apoptosis in human hepatoma HepG2 cells, but not in normal Chang liver cells. The present results can provide new hope for chemotherapy of hepatoma cancer. Furthermore, an improved understanding of the interactions between phytochemicals with the genes that are critical to the regulation of cancer cell growths will provide strong armaments to cancer therapy. Chaga mushroom (Inonotus obliquus), a white rot fungus, belongs to the hymenochaetaceae family of Basidomycetes. Since the sixteenth century, Chaga has been used as a folk medicine in Russia and western Siberia. Chaga mushroom have shown various biological activities, including anti-bacterial, hepato-protective, and anti-tumor effects. However, its molecular mechanisms to the anti-tumor effects have not been well documented, in spite of its increasing usage. Therefore, we investigated the anti-tumor effects of Chaga extract and the molecular mechanisms by which Chaga extract exert inhibitive effects on liver cancer cells, HepG2 cells. Eukaryotic cell cycle is regulated by signal transduction pathways mediated by a series of cell-cycle regulators. Therefore, induction of cell cycle arrest and apoptosis by chemopreventive drugs could be an effective approach to treat uncontrolled cell proliferation and survival in tumor cells. Though there were several reports that many natural products induce cell cycle arrest in various cell cycle phases, this study is the first report that reveals the inhibitory effect of Chaga extract on cell cycle in cancer cell lines. Chaga extract has selective cytotoxic effects on human hepatoma cells. Many reports indicated that cell cycle regulatory proteins such as p53 and p27, are up-regulated in G0/G1 cell cycle arrest. Nevertheless, we observed that Chaga extract induced the down-regulation of p53, pRb, and p27 expression in G0/G1 arrest. However, the precise molecular mechanisms involved in the decrease of the cell cycle regulator proteins, p53, pRb, and p27, are still unclear. Chaga mushroom may provide a new therapeutic option, as a potential anticancer agent, in the treatment of hepatoma. The authors investigated the anti-proliferative and apoptotic effects of Chaga mushroom (Inonotus obliquus) water extract on human hepatoma cell lines, HepG2 and Hep3B cells. Chaga mushroom may provide a new therapeutic option, as a potential anticancer agent, in the treatment of hepatoma.